A Christmas Treat for your Dog! 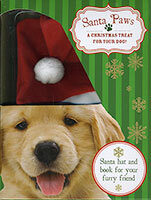 This merry box includes a book full of delicious recipes from Rudolph's Reward Biscuits to Juicy Christmas Cake as well as fun tricks and games such as a Christmas Kiss, a festive paw shake, doggy dancing plus a memory test too. Ho, Ho, Ho! This fantastic set includes a Santa hat trimmed with faux fur and a pom pom on the top.